The purpose of the drain in your kitchen and bathroom sink is to allow waste water to pass easily through your pipes and out of your home. Whether you are washing your hands, brushing your teeth, rinsing dishes off or performing other tasks at the sink, the ability to easily remove waste water in this fashion is important. However, a sink choke can easily develop, and when it does, you need to find a quick and easy way to remove the blockage. A sink choke may result in water draining very slowly out of the sink or not at all, and both can limit your use of the sink in some way. For example, a sink choke may make the use of the sink inconvenient, or it may entirely prevent you from using the sink until the issue is corrected. What Causes a Sink Choke? There are many causes of a sink choke, and some may be difficult to prevent. In the kitchen, a choke can develop when food waste is not properly ground up by the garbage disposal or when it is placed down the sink without being ground up at all. This often happens when the wrong side of the sink is used to rinse off dirty dishes. It may also develop if hot grease goes into the sink as a liquid and congeals before it is washed away. In the bathroom, a sink choke is often caused by a combination of soap residue, grease and loose strands of hair or other debris forming over time to cause a clog. In addition, a sink choke in both the bathroom and kitchen can be caused by foreign objects accidentally washing down the drain. When considering how to deal with a sink choke, you want to consider if you need to retrieve the object that has been lodged inside the pipe. In most cases, a resident simply wants to clear the pipe of the choke. 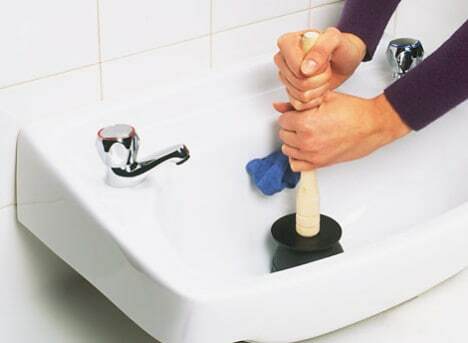 You may be able to use a plunger over the sink’s drain to remove some clogs. Another idea is to unfold a metal hanger and create a makeshift snake device. Both of these may remove your sink choke. However, if you need to retrieve the object in the sink or these remedies are not effective on your sink choke, you need to call a professional. A sink choke often may be cleared away by a resident’s own efforts in a matter of minutes. If your efforts are not effective or you are considering taking apart the pipe to retrieve an object that has fallen down the drain, you need to call a professional plumber for assistance. A plumber may use a number of different methods to clear away the sink drain choke. Professional plumbers in Singapore have long snake devices that can clear away chokes that are located several feet or more in the pipe. They can also remove a section of the pipe to remove chokes. Removing a section of the pipe is best done by professional plumbers as you want to prevent leakage issues. Most sink choke issues are an inconvenience, especially so if it is that of a pipe choke but they may not be a true plumbing emergency. Because you may not be able to use your sink until the choke is removed, you should look for a plumber who can arrive at your home quickly. Same-day service may be preferable. A sink choke can be a major inconvenience to contend with because it can render your sink unusable. If you have tried to remove your sink choke on your own without success, you will want to contact a Singapore plumber for fast service.